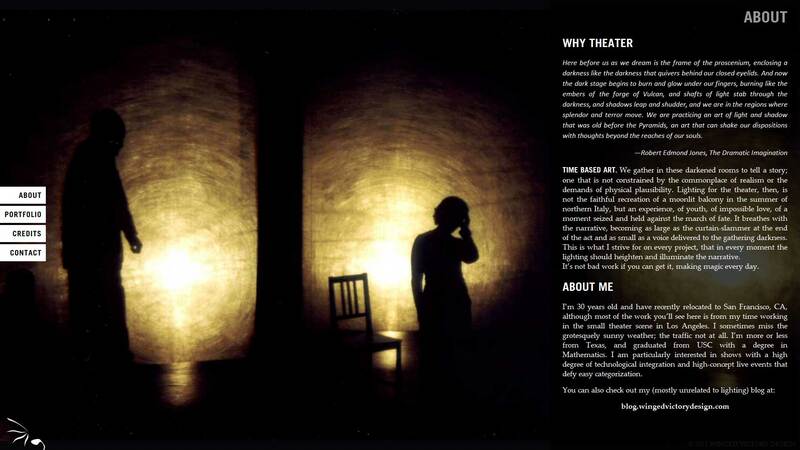 I am getting to be alright at this WordPress stuff: I’ve just completed a redesign of www.wingedvictorydesign.com, which is my theatrical lighting design portfolio. It’s the same content (for now, I have some new shows to put up there as well), but the pictures are larger and the layout is much nicer. I’m also working on getting my architectural lighting design stuff up on the web, that will happen soon-ish. In the meantime, if there’s anything you find seems broken or hard to use, do drop me a line!